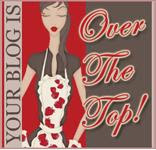 Last week Carol Kilgore at Under the Tiki Hut passed on the Over the Top blog award to me. This is a cool award. The rules are that I must mention Carol’s name and blog. Also I must answer a string of questions with one-word only answers and pass the award to five other bloggers here and by leaving a comment on their blogs. So first I’ll answer the questions, then we’ll talk about passing it on. Please visit their blogs and you’ll see for yourself how Over the Top they are – and in such awesome ways. This is a good idea. Is it open to anyone, or just the ones whose blogs are mentioned? Two awards in one day! I’m on a roll. Thanks! And one word answers looks tough, but I’ll give it a shot. Congrats on the award! Very fun post. I enjoyed reading your one word answers. Have a great day! Congratulations on the award, Cassandra – and thank you for passing it on to me!! You made my day! Hello, Cassandra. Thanks for coming over to my blog. I thought maybe you were one of the participants in the Blissdom blog conference I attended this weekend until I saw you reside in Australia. And then I was happy to see that you found my Temple Grandin movie review bc when I did a Google search ranking last night I gave up after five pages. Cheerio! Nice to know these things about you. Thanks everyone for your kind comments. The one word answers were a lot harder than I thought. You totally deserved it and I’m looking forward to reading your answers. It is one of the best things to do because you can pretty much do it anywhere. What a neat award. Congratulations! That’;s a great award! I hope I’ll be fortunate enough to be honored one day. I like the blog you have and am enjoying reading you. I think the blog circle is a great idea.